Long time readers of Family Friendly Gaming know I like to play games from independent developers because of how fresh many of their ideas are. Break-Out the Bible takes the concept of Break-Out and bounces it off the Holy Bible (literally). What makes this game even more interesting is I know the person behind this Personal Computer (PC) game. Break-Out the Bible has some great background graphics that show plenty of known Christian images from our rich history. A few of them looked stretched to me, which is not a big deal but it was noticeable. There are scripture verses included that teach gamers wonderful lessons. The different colored blocks contrast the background images nicely. The special effects when certain power up items are hit is impressive. Musically speaking Break-Out the Bible is pleasant to listen to. This is one area I would like to see improvements in - in future releases from Divine Games. I would like to be able to select musical tracks, or import my own tunes. A few of the power up item sounds made me cringe when hit repeatedly. That may be just me though. Break-Out the Bible has a level for every book of the Holy Bible. Some of them are quite challenging so do not expect to beat this PC game in one sitting. You will have to work diligently to be able to complete this game. Only one player can Break-Out the Bible at a time, so family members will have to take turns. My first confusion with Break-Out the Bible was no icon was loaded to my desktop, nor did it ask me to do that. Well I said okay that's no big deal it told me where it loaded it, and being tech savy I went and found the executable. I started playing this game and was having a real blast playing it. Then the ball hit the Bible and went straight down off the screen. This happens from time to time, and turned my joy to sorrow. This one issue is the only thing holding this game back from being an instant classic. I could see this game ported to the Wii if that one control issue gets cleaned up. [UPDATE 04/21/2009]: The developer provided me a patch that improved the physics of the bouncing ball quite a bit. The ball no longer drops straight down at random intervals. It does however (at times) go off the screen to the right or left and not allow me to put a new ball in play. [UPDATE 04/27/2009]: The developer has released another patch (version 1.1) that cleans up the control issues. It is always interesting to go from a low to a high in a video game review. The family friendly factor of Break-Out the Bible is near perfect. 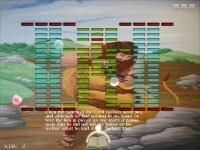 This game teaches wonderful lessons about the Holy Bible, and how to treat our fellow man. I would love to see sequels to this franchise, and take my hat off to the wonderful ideas behind this video game.